IHeart Organizing: IHeart The Land of Nod & a GIVEAWAY! 901 IHeart The Land of Nod & a GIVEAWAY! I am over the moon excited to announce that one of my favorite places to find swoon worthy storage, is sponsoring this week's giveaway! The Land of Nod is part of the Crate & Barrel and CB2 family, and although they specialize in selling the most fantastic and adorable decor, furniture and storage for kiddos, much of it is versatile enough to be used in any space for any age! Colorful? Check! Great quality? Check! Stylish? Check! Versatile? Check! So many reasons to love! The Land of Nod is here today to giveaway a couple of the super fabulous felt bins to one lucky IHeart Organizing reader! Did you know The Land of Nod also has a really fun blog? You can check it out here! These are so cute! With our first baby on the way, I'd love to win something like these! I love the Down to the Wire storage collection - vintage and modern at the same time! Love the wire storage baskets!! I love the straight and narrow book ledge! I'd love to win!! <3 The turquoise would fit my house perfectly! Love all the storage options! Love the storage bins most but there are sooo many things I can't make up my mind. I really love their wire baskets! We have the wall book shelf and love it!! LOVE the "I could've bin a container collection"
These are great. Love the storage ideas. I love the Jenny Lind bookcase...the felt bins would look great on it too! The wire baskets are fabulous. The wire baskets are cute! We use LON's round baskets for dirty clothes and toys. They really don't break!! I LOVE Land of Nod! I love the colorful baskets. I really like the rattan hamper - so cute and functional! I'm a sucker for burlap so of course my favorite pieces from the collection would be "Store by numbers" burlap containers. These are adorable! Cute and fun, yet functional, AND classy enough to be in the front room for guests to see. We could always use more boxes, I never seem to have enough. Would love these for my playroom do-over! Loving the "I Could've Bin a Container" line! I love the wire baskets. they would look great in my girls' room. I love it all! The compartment department bookcase is totally fantastic with the side storage. I love that it is all stuff you can see growing with the kid. I love these! This would be a great way to add color to my new home-- the whole thing is tan right now! Strappy-Go-Lucky 3 Bin Storage Set might be just what I've been searching for! I never would have thought to use round storage baskets, but I am loving the Kneatly Knit collection! The "I could've bin a container" organizers are GREAT! I love these bins. Thanks for the chance to win! I have always loved the bright colors of Land of Nod bedding. So cute! We need more storage in our teeny apartment! I loved the numbered bins for their versatility. love the Store By Numbers bins. they would look great in my boys' room. I love their colorful weave baskets. I love, love, love the "I could've bin a container" collection and what a cute play on words to boot. I love Land of Nod items! Love the numbered burlap containers! These are adorable! Can't wait to check out the rest of their site and those adorable woven baskets! wow, love pretty much everything! My favorite Land of Nod item is their teepee. Today I am loving the baskets with the different colored rims on top. I love the Strapped for Storage Bin Collection, and the Rattan I am storage collection in white or espresso. Love their stuff! Really... one favorite?! Ok, I choose the Top Box Storage Collection because of the stackability. Nothing beats opening up the hall closet and seeing things through nicely stacked (and labeled) plastic boxes (which can be rotated out to fit the current season)! I like the ''I Think I Canvas Storage''. I love the Jenny Lind bookcase. Great giveaway!! I love the paper clip wall hooks! Those felt storage bins look great! These are such cute bins, much better then the ones you can get at most stores! LOVE Land of Nod---Straight and Narrow Book Ledge would be awesome for my boys' rooms! love the wire bins! Thanks for the chance to win! Love Land of Nod. The wire storage baskets are a favorite. The I Could Have Bin a Container Memo Boards are really cute and useful for artwork. I love the colorful office supplies! The Land of Nod is absolutely my first stop for storage bins for my daughters room & playroom! Their products are awesome! I love the zig zag strapping baskets! wow awesome giveaway! we just moved into a home with only ONE Closet!! these would be fantastic!! While all of their storage items are fabulous, I have a fondness for their Jenny Lind beds. Being that we are homeschoolers I love the library carts but any of their storage will work great in our house with 3 kids. I love the mesh-like toy baskets! Love the stuffed animal basket! Love the vine storage bins! Too many great ones to pick just one! I love all their stuff! So cute and colorful! The strapping storage, but they all are so great! Love the wired world of storage bins! So cute. I love it all. And my kids stuff could use some organization! Oh my, I would LOVE to win this! I love the knit collection! These are so great!! I've never bought anything from The Land of Nod before, but I would love the Store by Numbers bins for my son's room! So many good things on their website. These would be perfect for my son's big boy room that I'm beginning to work on! I like it all! I was excited to see the colorful milk crates. Love all their new wire storage for kids! I have always loved The Land of Nod! The felt storage bins are great and would be nice in our nursery! I can't believe I live 10 minutes away from this store, and had no idea how the product offerings have exploded since I was shopping for a nursery. I am wowed by the colors, I love everything! I love the numbered canvas-y ones! I love the felt baskets. That would look gorgeous in my classroom! Such cute storage. Thanks for the giveaway! I love the ones that look knitted...amazing! Love the Hook Your Shelf Up shelves!! I love the Buffalo Check Storage Collection with the storage bookshelf - how perfect for a boy's room! The "Load Bearing" storage collection is perfectly chic. I love the cubed storage, perfect for the felt cubes! yayyy the felt bins are gorgeous, our storage bins are always being pulled down by a 3 year old so this felt option feels very safe. Thanks so much! I would love the Jenny Lind bookcase. Thanks for the opportunity. Love love love all things Nod!!! ahhhhhh! love me some land o nod! love the burlap bins with the numbers!!! I love any of the bins I can use for toys. Love those colorful woven baskets! I love the "bin there done that" bookcase, it's so smart for little ones to see the book covers and not the spine!! I could certainly use a few of those bins in my closet! I love love love the zig zag strapping baskets! LOVE! My favorite storage product is the wire wall bins, I would love to have several of them. Love their tubtrug outdoor storage! I love the wire storage and the strapping containers. They have such great stuff it is hard to choose. As much as I would like these I think I would give them to the grand kids. I actually really like the felt baskets. The vine baskets were cute too. I was JUST drooling over those felt baskets YESTERDAY on their website! Love em! The Kneatly Knit collection looks pretty amazing! I love their baby bedding. I picked up Oh What a Beautiful Morning for my best friend. Their selection is the best I've found. I love the burlap numbered bins! Would be perfect for my classroom!!!! I love the versitility of the Compartment Department bookcase! I LOVE LOVE LOVE the backpacks! ADORABLE! I love all the baskets!!! Those felt baskets are awesome! I love the color options! 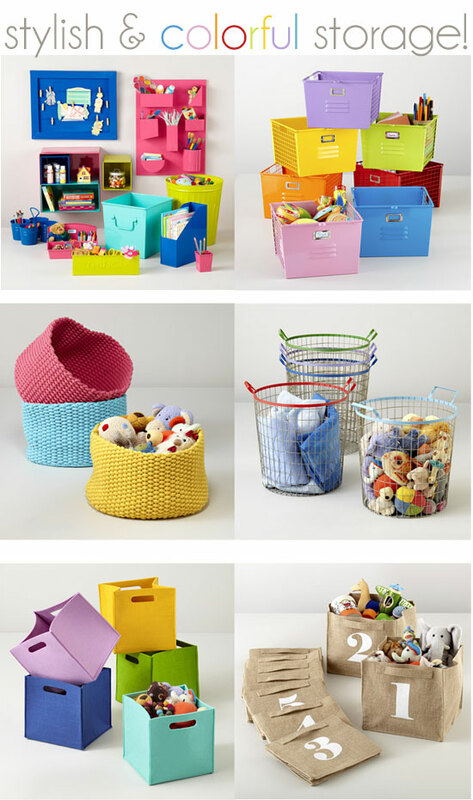 I love the felt storage bins, especially the color options, they would look amazing in my daughters room! I love the neatly knit medium storage bins!! But I love ALL of their storage stuff. OOh, what a perfect giveaway to help me decorate our new nursery!! I like how the top boxes stack! I love the buffalo plaid storage collection in yellow. I've never seen anything like that! love the felt baskets... yellow especially! Those felt storage bins look awesome. I LOVE The Vines Have It storage collection. So cute!!! love the knit storage bins! Oh my, we need the felt - my son destroys all other bins!! I love the knit storage bins... I am just starting out as a teacher and I think the numbered burlap sacks would be fabulous for class activities or rotations too! I love the felt storage bins! Love the espresso rattan collection! I have to say those felt bins look great! Perfect for kids odds and bobs! Love it all, but I really like the single storagepalooza! Nice, I love the look of lots of their stuff. They are all wonderful, but my favorite might be the bins that look like lockers! I love all of the bookcase options! Love the creative storage ideas!! LOVE their fun bedding for boys. My favorite is the robot bedding! 2 thumbs up for the colorful felt bins! I love the I Could've Bin a Container collection! I want it all! I like the knit storage basket collection. Thanks for the chance! i cant pick just one! they are all adorable! I drool over Land of Nod's website all the time. They have the most adorable stuff! I really like all of there stuff but especially the strapped for storage bin collection. Oops, I think I messed up! I tried to delete my comment and add a new one but not sure if it worked. Anyway, I love everything but especially the wire baskets! I love their strapping basket bins. Loving the knit storage collection! love the Down to the Wire storage collection! I love it all! I really like their wire baskets though. Awesome! I am new to your site and already addicted and would love these. I am very inspired by you to get organized!! 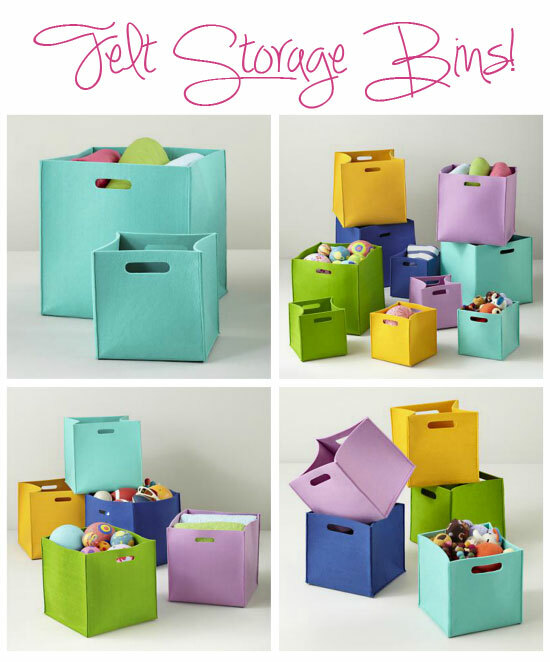 I love all the different options for storage bins. Everything is so colorful! LOVE Land of Nod storage items! I'm loving the colorful locker looking bins! I am thinking they would be great book bins in my classroom! I'm loving their bright and bold fall collection! But I absolutely love it all! The felt!! That green is awesome! I love the felt...I have grey felt ones already (from another store) and would love to add some color to the mix! My house desperately. Needs organization! I love the Once More with Felting storage collection!! I like The Vines Have It. I like the felt bins! I love Land of Nod, and I'm in the middle of revamping the kids' playroom so these would be perfect! Very nice! Those sturdy looking ones on the top right look great. My daughter's bedding is from Land of Nod and I LOVE it! I get compliments on it all the time!! I LOVE those bins! They are great to store things in ... and fold flat if you empty them! Perfect combo!